The University of Minnesota Solar Vehicle Project team provided a sneak preview of its newest car today at a special event for the media and project sponsors. Those attending saw the car take its first test drive, viewed the inner workings of the car and heard from members of the team about their upcoming race. The general public is invited to view the car and talk with members of the team from 2:30-3:45 p.m. Friday, May 9 at the University of Minnesota in the courtyard east of Lind Hall, 207 Church St. S.E., Minneapolis. These are the first public viewings of the car in preparation for the 2008 North American Solar Challenge, a 2,400-mile race from Dallas, Texas, to Calgary, Alberta, July 13-22. The University of Minnesota is one of only 26 international teams competing in designing, building and driving a solar-powered car in this year's cross-country event sponsored by Toyota. The last North American Solar Challenge was in 2005. 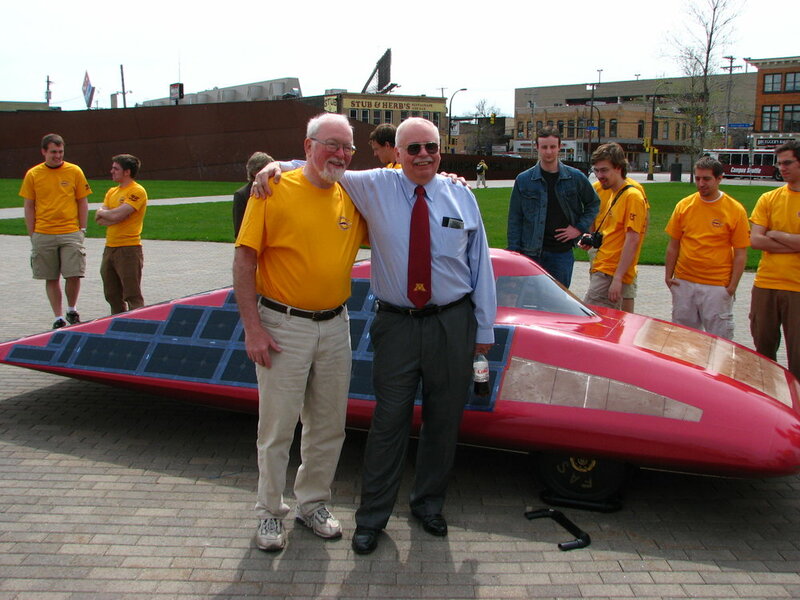 The University of Minnesota's car, named Centaurus, is a completely new generation design from the university's previous seven solar vehicles. The most noticeable change is that the design meets new race requirements for the driver to sit more upright in the car compared to previous vehicles. The current car is just over 3 feet tall, about 16 feet long and nearly 6 feet wide. It weighs about 420 pounds without the driver. "While we won't all soon be driving solar race cars like this one, projects like this are a step in the right direction," said Sam Lenius, a senior electrical engineering student and team leader. "Much of the technology we are applying to design and build this car could possibly be used in other cars to make them more fuel efficient and better for the environment. That's something we are all very proud to share." The 30 students on the team are all from the Institute of Technology, the University of Minnesota's college of engineering, physical sciences and mathematics. Team members estimate that they've collectively spent more than 30,000 hours over the last year planning and building the solar car. Materials for the U of M's solar car were funded through cash donations and in-kind donations of parts and materials. Team Advisors Prof. Patrick Starr and Prof. Jeff Hammer. 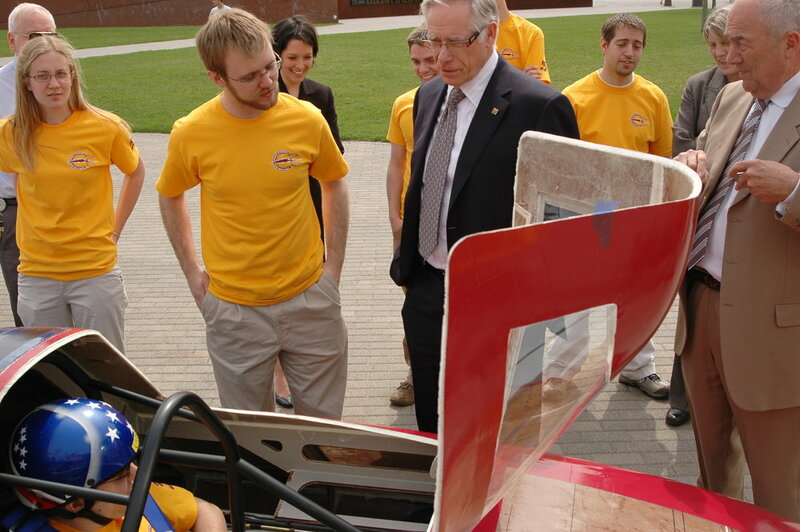 Showing off Centaurus to University of Minnesota President Robert Bruininks. Major sponsors of the University of Minnesota Solar Vehicle Project include 3M, Advanced Circuits, AIRTech International, Caterpillar, Digi-key, DuPont, EMJ Metals, Empro Shunts, Freescale Semiconductor, Future Lighting Solutions, General Plastics, Lockheed Martin, Magnetics Inc., Noritake Inc., Northwest Airlines, PaR Systems, Philips, Remmele Engineering, Sal Clear, Stevens Urethane, University of Minnesota Institute on the Environment, University of Minnesota Initiative for Renewable Energy and the Environment and Vicor.